Finland is a Nordic country with around 5.3 million inhabitants. Most of the Finns live in the southernmost area of the country, around the three biggest cities: the modern capital Helsinki, the historical capital Turku and the inland city of Tampere. Finland is nicknamed "The Land of Thousand Lakes" - in reality, the number of lakes is over 100 000. Finland is also known for its beautiful nature in Lapland and coastal archipelago. Finnish and Swedish are the two official languages in Finland. Finland is a member of the European Union and the official currency is the euro. With 350 000 inhabitants within its metropolitan area, Tampere is the biggest inland city in Scandinavia and the second biggest city in Finland. It is located in southern Finland 200 kilometers northwest from the capital Helsinki, in the region of Häme, in a narrow ishtmus between lakes Näsijärvi and Pyhäjärvi. 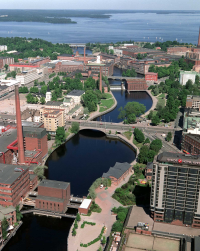 Tampere is an old industrial city and the product of the 19th century industrial revolution. The city has grown around the linen and cotton factories taking their power from the Tammerkoski rapids. Nowadays de-industrialization has deminished the old role of heavy industry and many former factories now operate as museums. See the full package of tourist information at GoTampere.fi.